Cats scratch for many reasons. They transfer their scent through their claws and use scratching to mark their territory. Cats also shed the outer layer of their nails and use scratching to facilitate the process. Sometimes, if you don't clip your cats' nails often, they curl around underneath, causing pain to your kitty (and sometimes, to you!) However, for the sake of your skin and your furniture, cats need to utilize scratching posts to fulfill their needs without ruining your house. There are many different options, and you can even incorporate scratching posts into your decor. By purchasing a colored scratching pad (sold at pet stores and online pet supply sites), and having it framed in an unfinished wood, you can create wall art that your cat can use! Add catnip to any scratching post or pad you'd like Kitty to use and watch them go at it! But soometimes posts aren't enough. Some cats scratch at people or other pets, or continue to use your favorite chair as their favorite scratching post despite all efforts to get them to desist. 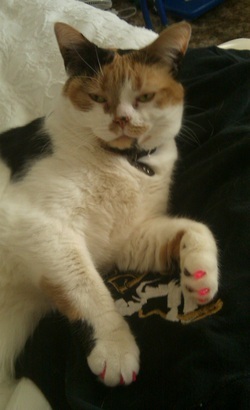 Instead of declawing your cat- which is brutal and inhumane- there is another, easier option. We at C.A.T.S. love SOFTPAWS. One of our former rescues, Ophelia (you may have seen her around our site!) has a bit of a problem with her resident dog, Tibbles. Because she wouldn't stop terrorizing the poor pup (she is a calico after all) her mom invested in these SoftPaws. Developed by a veterinarian, SoftPaws are a soft plastic cap that covers only the tip of a cat's claws. They are put on with non-toxic glue, safe if swallowed, and come in a variety of colors! Ophelia was hesitant about hers at first, but after 10 minutes she did not even notice they were on! Now if she swipes at the pup, he doesn't feel it but she still feels like a Big Bad Cat! Not to mention, the bright pink matches her diva attitude. SoftPaws last for weeks if applied correctly, are relatively inexpensive, and can be bought online or in pet stores (although we only found the clear ones in stores, and because Ophelia has a knack for getting out of things she doesn't like, we thought the colored ones would be easiest to notice in case she slipped one off!). Cats will sometimes spray urine if they are upset, or sick. Most cats would much rather use their litterbox, and will only "go" elsewhere if they are not feeling well or if their box is not cleaned. 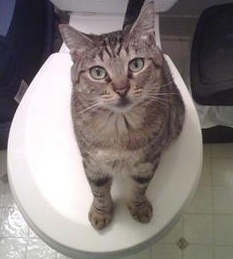 The best way to prevent inappropriate urination is to maintain a clean litterbox. If your cat is relieving themselves elsewhere, first be sure their box is cleaned and there is not an outside source upsetting your cat. If everything seems normal, we suggest making an appointment with your vet. However, in the meantime, there are some wonderful products that will help with the odor and staining of the occasional kitty slip-up. Here are some of our favorites. The important thing to remember is that infrequent urination SHOULD NOT BE A DEAL BREAKER for you and your cat, and that frequent urination SHOULD BE ASSESSED AND TREATED BY A VETERINARIAN!